Life in colour: Blog rebirth! Hello everybody and welcome to my blog in English! I hasten to inform you that my blog will be in English from now. Let's mark this day as an official rebirth of 'Life in colour' blog. Why have I made such decision? Well, I realized that the amount of English-speaking people I'd like to share my creative ideas with is much bigger than Russian-speaking, and frankly speaking, a lot of Russian-speaking people understand English very well, so they won't have problems following my blog further. The second reason is that I started using a lot of social networks (Flickr, Networked Blogs on Facebook, Twitter, Etsy, Bloglovin', Ravelry) to share my ideas and exchange experience with other crocheters, knitters, amigurumi makers and other interesting creative people, and of course I want them to understand what I'm writing about. I already have some posts in Russian and I'm going to leave them as is. I'll translate them shortly (schemes, explanations, recipes) and make a separate post. As you can find from short 'About me' I'm a web developer from Ukraine (Eastern Europe). I live and work in the capital of Ukraine - Kyiv. 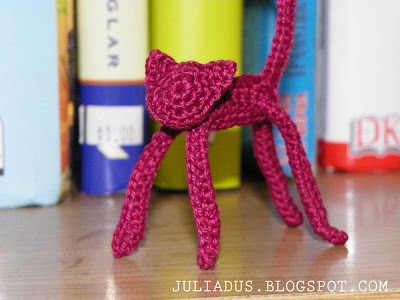 In my free time (sometimes I have it) I love to crochet, knit, decorate my home, create amigurumi - small cute crocheted/knitted creatures, cook, paint, read, travel and do other pleasant things. My amigurumi family already consists of Girl, Hippo, 3 Ladybirds (Green, Pink and Blue), a Mouse, Acorn and two Cats. Actually the last two had to leave the family, as they were presented to my friends. Ball cat is on the picture below. And red cat on wire base. I'll translate tutorials soon. Moreover I'm working on a new project right now and going to write more about it when finish. Check back for updates soon. Later I plan to acquaint you with Ukrainian cuisine, Ukrainian places of interest, Ukrainian traditions and a lot of other interesting things. So stay connected and feel free to post your comments. Thanks for visiting me on 'Life in colour'. Wish you colorful pleasant weekends!